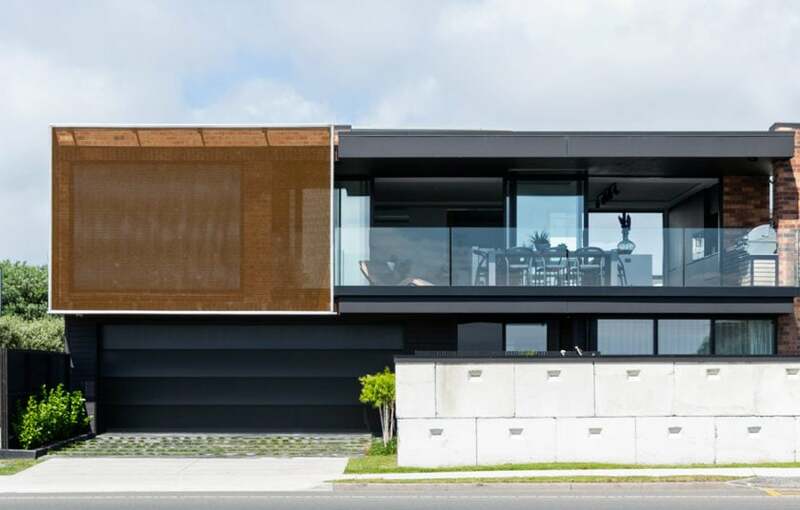 It’s unexpectedly urban for being by the beach, but this home proves you can have it all. 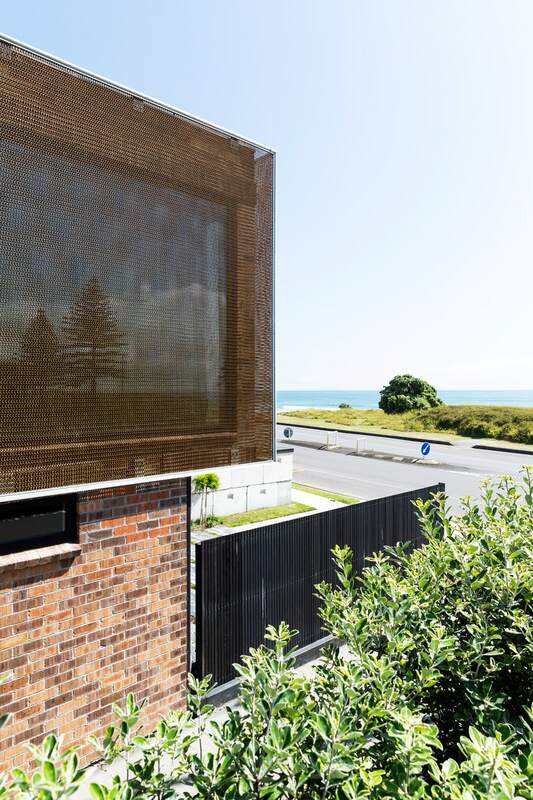 Building “on a pinhead” is less than ideal, but in the case of Milly and Brent Stewart’s home, the result is more than satisfactory. 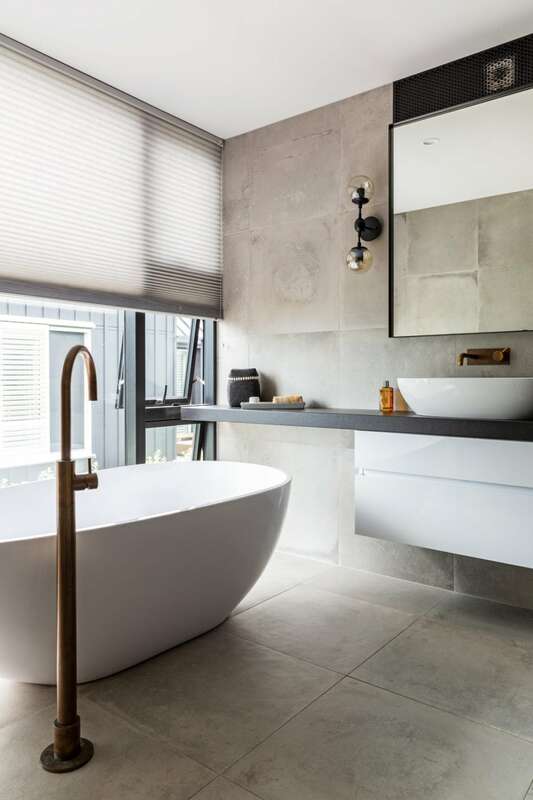 Admittedly, the duo was well equipped to deal with the difficulties of building a 302m2 house on 269m2 of land — as owners of Stewart Construction, they’re practised at working with small sites, and in fact, they enjoy the challenge. The screen isn’t the only thing about this dwelling that veers from the norm. Brick and weatherboard homes tend to see the bricks at the base and the boards on top, but Brent made the call to flip that on its head. “It was just about being a bit different. No one really does it, but we liked it,” he says. TOP The stairs themselves are made of black steel in a honeycomb-like pattern, and Milly says she loves the way light shining through the filigree throws shadows onto the concrete floor at night. ABOVE Milly and Brent wanted a minimal kitchen with clean lines. They also entertain a lot, so a large island and a bar fridge were essentials in the brief they gave to designers and makers Di Rosa Cabinetry & Furniture. 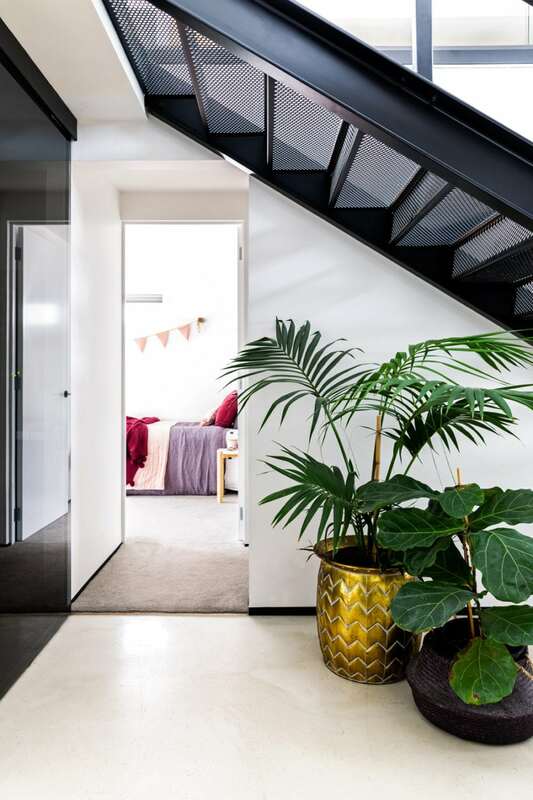 True to this aesthetic, the home features a black steel staircase and concrete in the entryway and kitchen — though not concrete as you know it. Smooth and warm underfoot, it’s created from a floor-levelling compound finished with a concrete sealer. 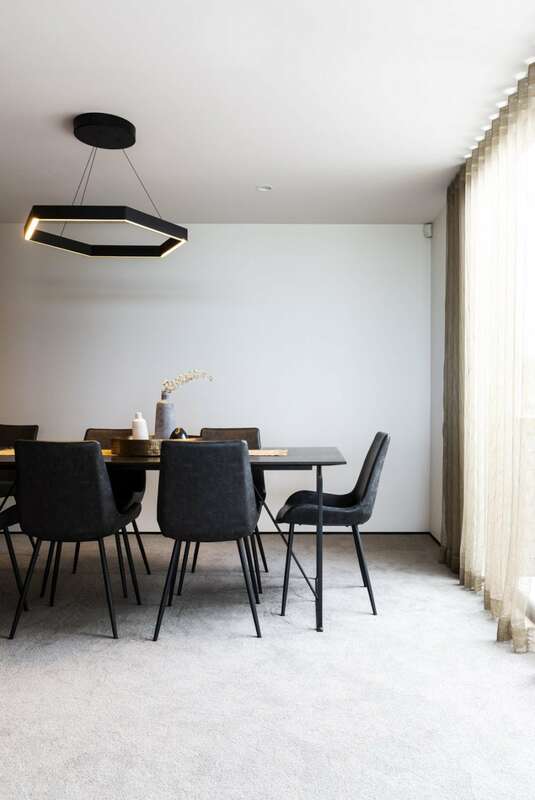 TOP The family’s dining room table and chairs were designed by David Shaw and purchased from favourite Mt Maunganui haunt The Design Depot. Overhead is a pendant light by Simon James. 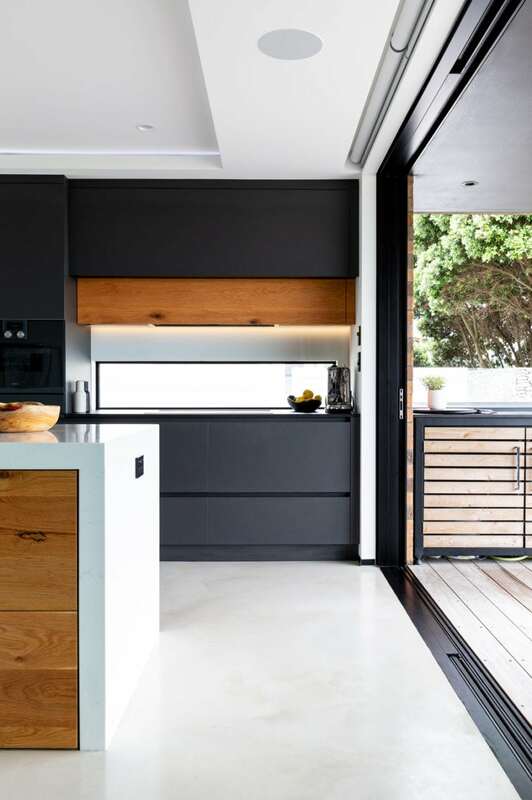 ABOVE Huge floor-to-ceiling doors connect the kitchen to the mahogany deck. Although Milly and Brent have built and renovated many homes, they were happy to give Adam free rein to focus his architectural skills on evolving their initial concept. 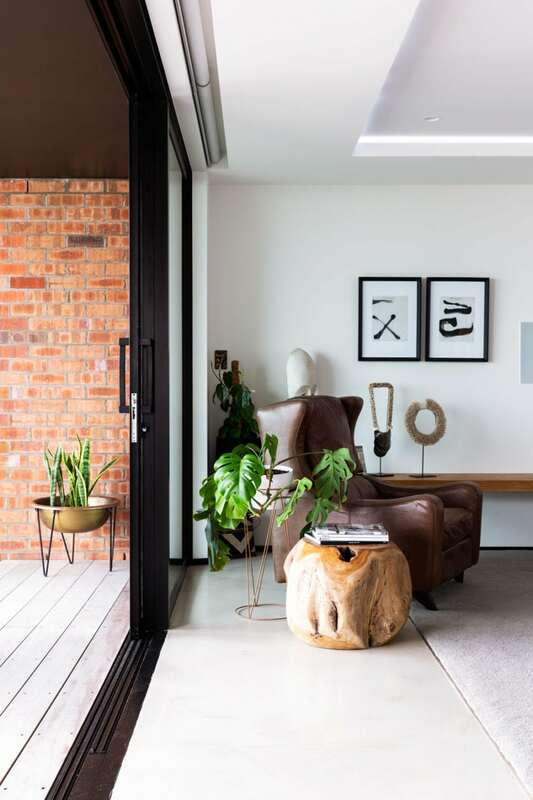 What the three came up with was a layout that sees a second living room, the children’s bedrooms, the bathroom and the laundry on the ground floor with a double garage and jet-ski parking space. Upstairs houses the main living areas, master suite and powder room. TOP A textural vignette is formed in the living area from a teak side table, an armchair from Freedom, and artwork and objects from The Design Depot and Style X Lab. 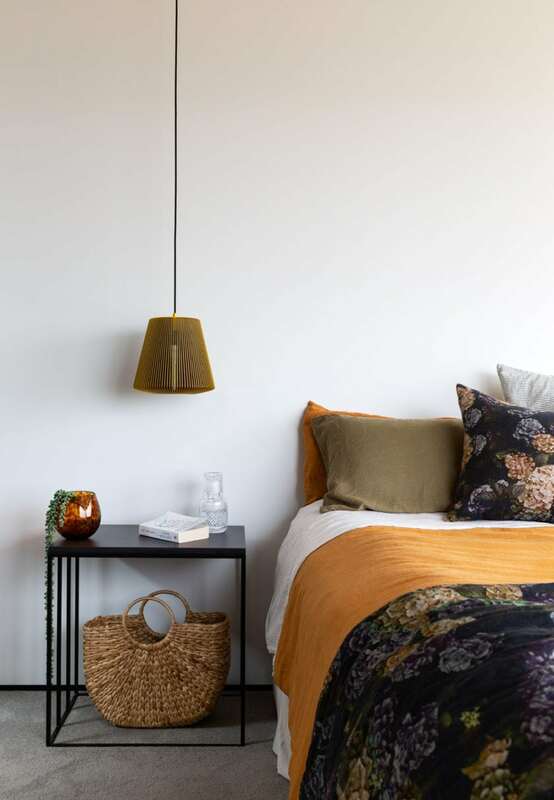 ABOVE Decorative elements in the master bedroom include a crystal water carafe from The Design Depot, a cane bag bought back from a trip to Bali and a Hydrangea cushion and throw by Thread Design. 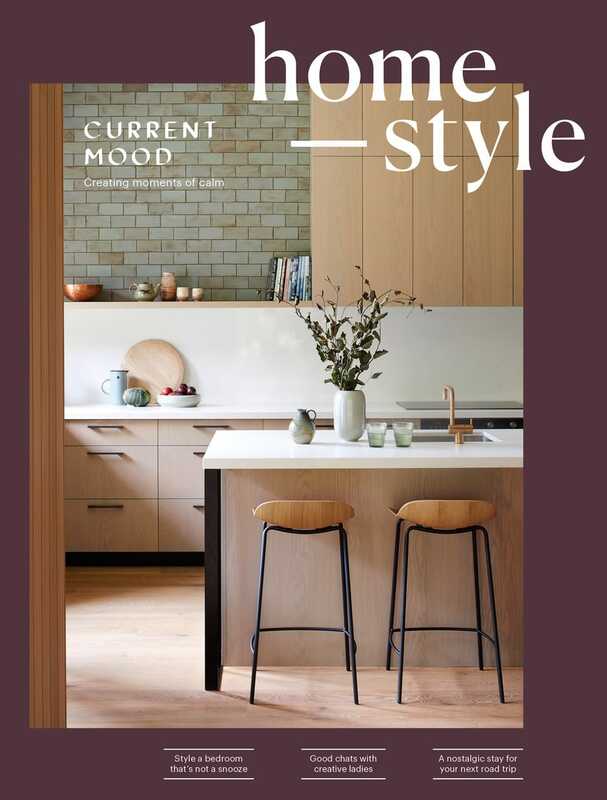 A full-length French oak slider can be used to divide the dining room from the rest of the open-plan living space. The dining room includes a bar, so the ability to close it off for use as a zone where the grown-ups can get out the whisky and turn on the mood lighting is a boon. 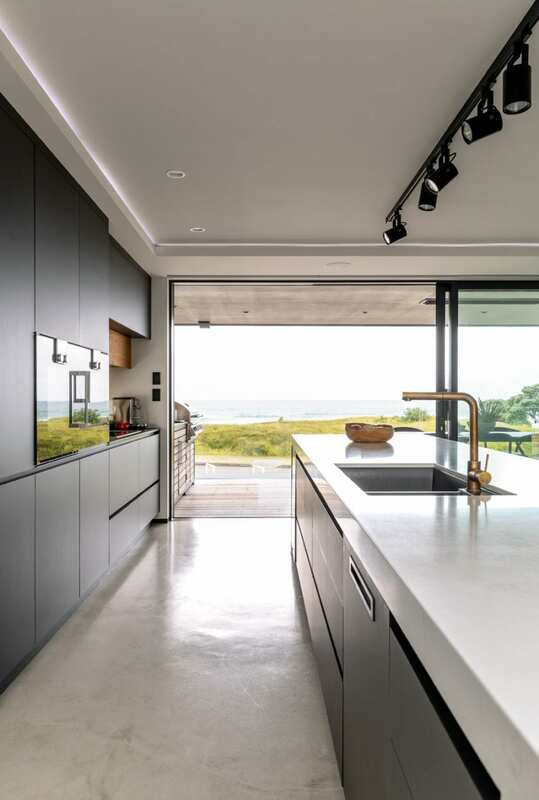 To provide an uninterrupted view of the ocean, the main living area’s northeast-facing wall is entirely glass, with stacker doors framing the vista and connecting to the deck, which at 11m is big enough to house Brent’s must-have outdoor kitchen. The splendour of the outlook meant the interior was best kept clean and Resene Quarter White Pointer provides a chic neutral backdrop throughout. 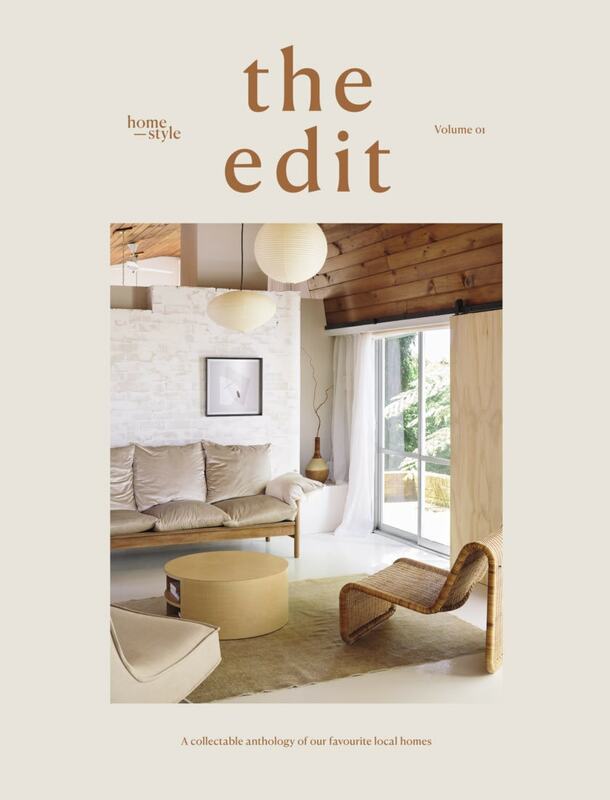 TOP A freestanding Egg bath by Progetto is a luxe addition to the couple’s ensuite. ABOVE The powder room is petite but packs a visual punch. “I wanted the walls to be dark, so our painter blended several Dulux colours together to suit,” says Milly. 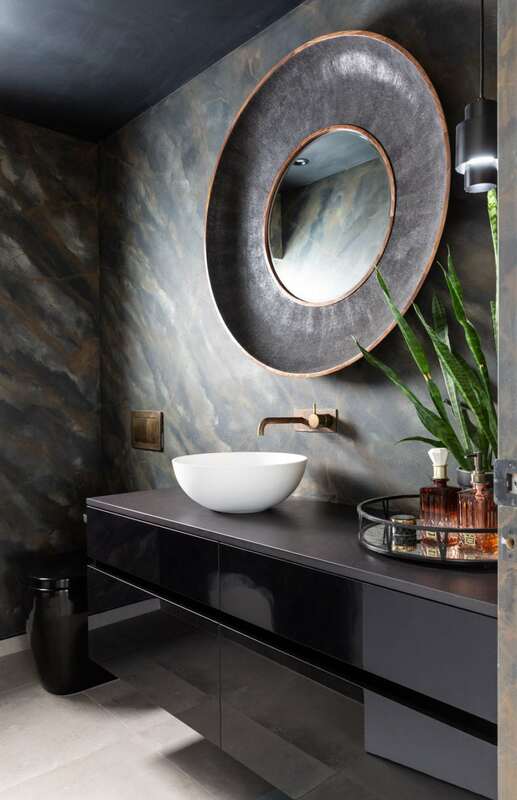 The aged-brass Buddy tapware and Thin Round Vessel basin are both by Plumbline, the mirror is from MCF Interiors and the vintage glass tray is from The Design Depot.